Lock in a great price for Intercontinental London - The O2 – rated 9.4 by recent guests! Staff, club service, restaurants, location, cleanliness, technology, spa/gym, just about everything! Best breakfast at any accommodation we have stayed in. Check in was excellent, room great. Loved whole stay. This was my second stay here. I loved it the first time I stayed when I came with my friend to see a show at the o2 and knew I had to come back with my partner. From the moment you arrive you feel well looked after. The staff are a credit to the hotel very polite, professional and not over bearing. The view from the rooms are exceptional. 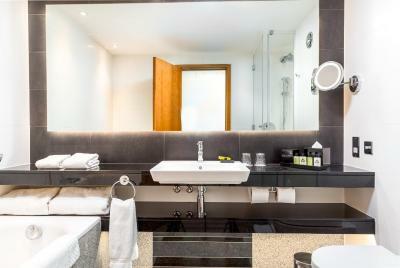 The rooms are stocked with everything you need for a luxurious stay. Although there was nothing I was missing or required I felt it would have been no trouble and I would whole heartedly recommend staying here . Even if you aren’t visiting to see an event at the o2 I would still recommend as the hotel is really special and it’s a short walk to the o2 where you can go and have drinks and food with plenty of restaurants to choose from! I would also recommend you visit the eighteen sky bar within the hotel ( which is on the 18th floor!) you can book online . You can enjoy fantastic cocktails with a gorgeous view it really is special. The room was lovely the bed very comfortable and the location was great. Lovely room, exceptional view, beds very comfortable. Very friendly and helpful check in staff, room was spacious and very comfortable with great view out over the Thames towards Canary Wharf. Stayed for one night but could easily have stayed longer. Fabulous location for the O2. A lovely warm welcome when we arrived and an upgrade too! Amazing views. Beautiful hotel. Service from check-in to check out was superb as usual. Breakfast was a little busy but I think we timed it just right. Intercontinental London - The O2 This rating is a reflection of how the property compares to the industry standard when it comes to price, facilities and services available. It's based on a self-evaluation by the property. Use this rating to help choose your stay! Intercontinental London - The O2 offers accommodations in the Greenwich Peninsula. Guests can enjoy the onsite spa and free WiFi. 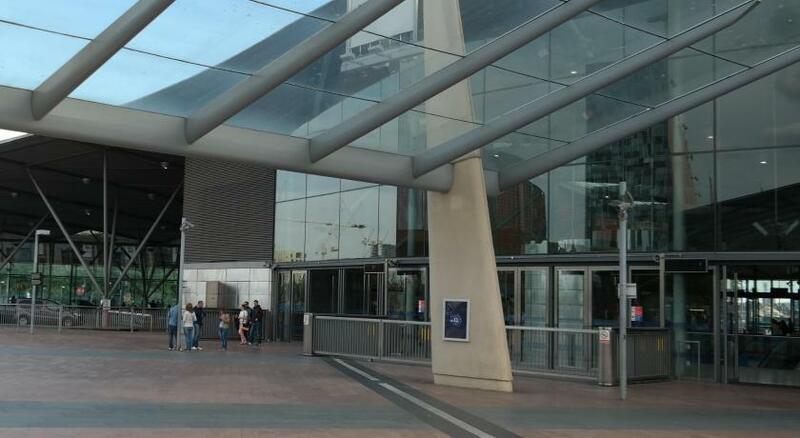 The O2 Arena is attached to the hotel via a covered walkway, which takes 5 minutes' walk. Intercontinental London - The O2 has a 24-hour reception and a large conference center. The Arora Ballroom is the largest pillar-free event space in the UK. There are additional 19 meeting rooms. 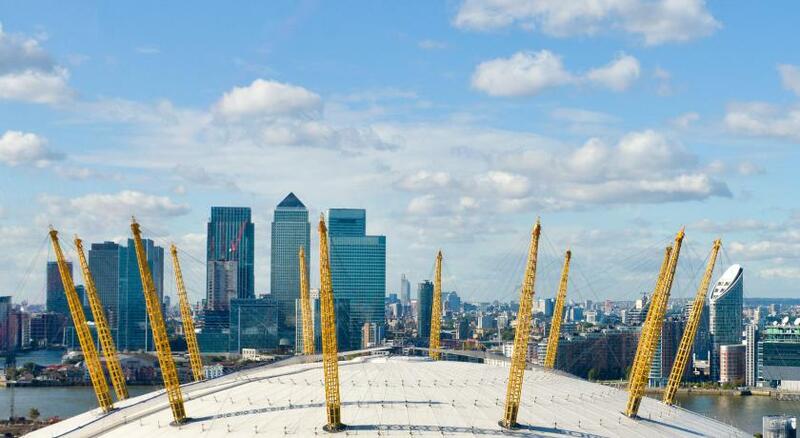 London City Airport is just 5.1 miles from the Intercontinental London - The O2 while the Excel Arena is 4 miles away. North Greenwich Tube station is just a 5-minute walk away and the Emirates Airline Greenwich is a 10-minute walk. When would you like to stay at Intercontinental London - The O2? This double superior room features free WiFi, 42" smart TV and air conditioning. The granite bathrooms have a separate bath and walk in shower with luxury amenities. Guests can enjoy views over the River Thames, Royal Greenwich or the O2 Arena. The rooms range in size from 29 square yards to 32 square yards. This superior twin room features free WiFi, 42" smart TV and air conditioning. The granite bathrooms have a separate bath and walk in shower with luxury amenities. This superior twin/double room features free WiFi, 42" smart TV and air conditioning. The granite bathrooms have a separate bath and walk in shower with luxury amenities. This deluxe twin/double room features an espresso machine and air-conditioning. It also offers views of historic Greenwich, the O2 Arena, the River Thames or Canary Wharf. Guests will have access to the Club InterContinental, which is available at a supplemental charge. This deluxe king room offers views of historic Greenwich, the O2 Arena, the River Thames or Canary Wharf. It also features an espresso machine and air conditioning. This twin room features a mini-bar, tea/coffee maker and air conditioning. This room can accommodate 2 adults and 2 children up to the age of 12. The suite features a flat-screen TV, air conditioning and electric kettle. Step into tastefully decorated rooms and suites with the latest innovations, rain showers, and brilliant views and enjoy a destination inspired culinary experience at the 5 food and beverage outlets. The newly re-opened Peninsula Restaurant, offers an award-inspiring dining experience with European cuisines deftly infused with exotic spices while the Market Brasserie encompasses provenance and spirit of the famous London markets using local produce in an open bustling theatre kitchen. Enjoy quintessential afternoon teas, hot chocolates and freshly made pastries in an elegant and relaxed setting at Meridian Lounge. The Clipper Bar is an architectural work of art with spectacular floor to ceiling views and premium beverage offerings of bespoke gins and original cocktails. Last but not the least; enjoy light dishes with an excellent drinks selection while taking in unrivalled views of London, at the stunning and sophisticated Eighteen Sky Bar. Explore a different side to London with the family or enjoy a relaxing break away from the bustling city among the serene surroundings of the river. Hotel surroundings – This neighborhood is a great choice for travelers interested in live music, riverside walks and nightlife – Check location Excellent location – show map Guests loved walking around the neighborhood! House Rules Intercontinental London - The O2 takes special requests – add in the next step! Intercontinental London - The O2 accepts these cards and reserves the right to temporarily hold an amount prior to arrival. The debit or credit card provided for the pre-payment needs to be presented upon arrival for verification. In case of the card not being available upon arrival to the hotel, guest will be asked to pay with an alternative card. Fantastic from check in to check out. Perfect location for O2 events. Huge rooms, fabulous views, wonderful bathrooms and gorgeous breakfast. The hotel was in perfect location for our visit to the o2 and the shortcut into the o2 was useful for us. The room had an amazing view of the Thames and the room itself was worth the money. The bathroom was clean and the beds were comfortable. The staff were friendly and helpful and approachable. It would of been good to have a free mini bar to use instead of been charged extra. Drinks and food ridiculously expensive. £15 for a gin and lemonade! £3.50 for a kitkat, £25 each for breakfast. Staff were friendly, immaculately clean hotel. Rooms are lovely. Hotel connected to the O2. Bed extremely comfortable. Friendly staff. Thank you to Stephen who gave us a lift to station. Slightly overpriced for the room we had. Very clean, close to venue and easy to find. Breakfast wasn’t worth the money & beds were not very soft & toilet roll could be softer.